Here’s a blast from the past. A tale about RMS from back in the days when Roblimo was young — younger than he is now at least — and Stallman was…well, Stallman. This is a true story about something that happened at a Department of Commerce treaty hearing in Washington D.C., the kind of event that gets (nearly) zero press even though it’s important. In fact, I was the only reporter there, covering it for Linux.com because some of the proposed treaty language had to do with software patents and licensing — and also because two people I knew were testifying, namely Jamie Love and Richard M. Stallman. 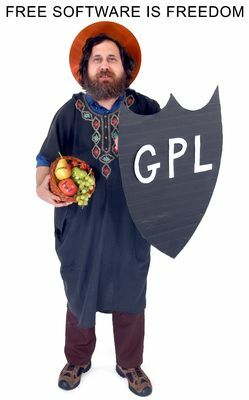 Most of us think of RMS (as he is known to both Sundry and All) as a dour person, always ready to hurl bolts of GNU Lightning at anyone who disagrees with his principled stance on software licensing or his many other strongly-held beliefs. But that’s just in his day job. Once he’s done with work, he turns the lights down low and the pleasure card comes out. 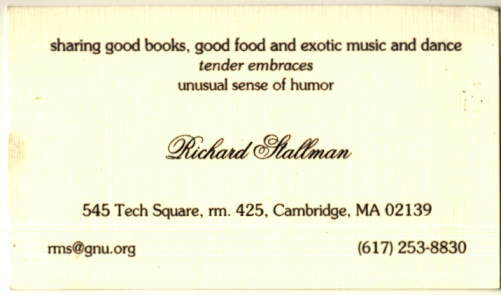 Not business card. Pleasure card. I’ve provided a picture of one in case you don’t want to believe me about this bit of RMS trivia. I first saw an RMS pleasure card when the above-mentioned Commerce Department hearing broke for lunch. Suddenly, on a surprisingly nice day in our nation’s capital, we were sitting in front of the building on a low retaining wall between a circular driveway and an inviting lawn. Besides Richard and me, most of the people eating there were young, attractive Commerce Department female attorneys. Richard said the grass looked inviting and immediately flopped down on it. So did I. “But you’re supposed to stay off the grass,” one of the pretty lawyers said. “I don’t see a sign,” said Richard (or words to that effect). I didn’t see one either — and besides, as a taxpaying US citizen, I figured it was my lawn and if I wanted to sit on it, I was damn well going to. Such rebellion! Such manly virtue! The young ladies, to a lass, were as impressed as if RMS had run a sportsball 200 yards for a bases-loaded home run touchdown. They crowded around him, and he ate it up. And handed out pleasure cards. Wow! Now, I had heard before that RMS attracted groupies, same as any other rock star. But when you picture RMS groupies, what comes to (my) mind is a group of stocky girls in jeans who are all carrying O’Reilly books about GNU Emacs, not a bevy of beauties in pastel dresses and skirts carrying attache cases. But there they were. I wouldn’t have believed it if I hadn’t seen it with my own eyes. But once I did I started to wonder if, perhaps, the rumors were true about RMS no longer being able to crash where he worked at MIT, years ago, because so many women ran in and out of his sleeping hideaway that they disturbed both faculty and students. I also remember sitting at home in Elkridge, MD, where I lived until a decade into this century, and having an unexpected, quite attractive female visitor who claimed to be Richard’s girlfriend. She was there with a young man I knew well, who was a devout Stallman acolyte, so I had no reason to doubt her. Plus, I later heard her name (which I am withholding out of kindness) mentioned in common with his, so yes, she was who she said she was. Have you ever met a man you didn’t see why women would cozy up to, but they did? Or, in the interests of non-sexism, a woman you wondered why men liked, but they did? Wow. If there is ever an all-star team for Mental Sportsball, RMS is sure to be on it. I’d vote for him. Wouldn’t you? And I’m sure a whole lot of attractive women — not necessarily all Free Software devotees — would, too. I thought there would at least be a passing mention of a love child or two, and steamy goings-on at Librecon in the small hours. At this point you’re just trolling the trolls. OTOH he once stayed the weekend with a friend in the UK. dgrb I’ve heard that one before. I had the distinct honor of hosting Richard in my home for a conference held in Hawaii. He was delightful, funny, and a gracious guest. When we went out to some bars in Honolulu, RMS was a star. I felt awkward and out of my league. And, you must picture this, Richard went to the bar with his laptop dangling around his neck with his homemade strap. And this made him a bigger hit at the bar – because he is so genuine and funny. Richard taught me more about balancing my economic needs through capitalism as a means to support my charitable endeavors in FLOSS than any other human I have ever met. Period. I’m actually not surprised. RMS is simply being himself, without much care whether people can handle him being himself. I, personally, find that rather refreshing in a country where people are wearing masks all the time. I’ve admired his principled stance on digital freedom for a long time. It was his arguments that got me to learning and using Free Software.